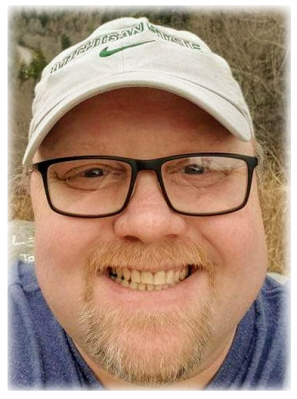 Chadd Henry Warren, age 45 of Lansing formerly of Ovid, Grand Rapids and Kalamazoo, MI passed away Sunday, April 7, 2019 at Sparrow Hospital, Lansing, MI. A Celebration of Life will be held at the Redeemer Lutheran Church, Owosso, MI on Saturday, May 18, 2019 at 2:00 P.M.
Chadd was born in Owosso, MI on October 9, 1973 the son of Gary Warren and Carol (Castle) Self. He was a graduate of Ovid Elsie High School. Chadd just accepted a position at Rainbow Trout Lodge in Alaska and was leaving in May. Chadd's passion was cooking, especially for family and friends. He was an avid sports enthusiast, especially the Spartans and any Detroit team. Chadd loved to camp, sitting around the fire pit and spending time outdoors. Family and friends were the most important part of his life. Chadd loved his cats, he rescued and cared for many animals. He also had a strong faith in God. He is survived by his mother Carol Self of Portage, MI; father Gary Warren of Owosso, MI; brother Benjamen Warren of Ovid, MI; sister Briana Pettet of Owosso, MI; brother Aaron Self of Portage, MI; grandmother Sally Garver of Owosso, MI; and niece Aria Pettet. Chadd is also survived by many aunts, uncles and cousins. Chadd was preceded in death by sister Emily Murray, brother Sean Warren, step-mother April Warren, and cousin Nicole Hamlin. Memorials may be made to the wishes of Chadd's Family. Online condolences can be made to www.smithfamilyfuneralhomes.com. The family is being served by Smith Family Funeral Homes - Houghton Chapel, Ovid, MI. There's still time to send flowers to the A Celebration of Life at the Redeemer Lutheran Church at 2:00 PM on May 18, 2019.